In today’s consumer-driven, media-saturated society, it isn’t always easy to instil a sense of financial responsibility in children. Yet doing so will be one of the best gifts a parent can give a child, and one of the best investments in his or her long-term financial and personal success. Experts in psychology, child development, and personal finance cite a number of attitudes, activities, and techniques that any parent can use to strengthen a child’s ability to deal with dollars and cents in positive and constructive ways. It’s important for kids to see their parents setting a good example. Let them see you balancing a checkbook, paying bills online, tracking expenditures, even compiling your tax returns. Children who see the adults in their lives being financially responsible and attentive to obligations will find it easier to incorporate healthy attitudes and practices into their own lives. 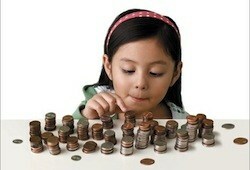 As soon as your children can count, let them become familiar with money and help you add up purchases or expenditures. Verbalize your feelings about money, saving, investing, and providing a secure financial future for your family. Allow children to see the connections between your emphasis on financial planning and the lifestyle, travel opportunities, and education that your investments have provided for them. Additionally, help them grasp the differences between what they may want and what they truly need. All of these interactions will lay the groundwork for their ability to set reasonable limits on their future spending. A trip to the grocery store is often a child’s first exposure to the world of money and finance. Use this as an opportunity to plan economical meals together create lists of needed items, and look for money-saving coupons. While at the store, show your child how to compare quality and price, and how to determine the real per-unit cost of any item. Since about one-third of a typical family’s income goes toward food and household products, demonstrating the value of saving in this area can be a regular lesson in basic economics. There are plenty of enjoyable children’s picture books with money and finance as themes. Judith Viorst’s Alexander, Who Used to Be Rich Last Sunday and If You Made a Million by David M. Schwartz are two examples of well-written, engaging stories that also have a financial lesson in them. By using your local library or bookstore, you and your child can discover many more titles to both entertain and educate you about personal finance and financial responsibility. Help your child to prepare for his or her own future by learning to set practical and appropriate goals, whether that involves schoolwork, athletics, or simply saving up to buy a special toy or game. Talk with your child about your planning for his or her educational future. United States savings bonds are still an excellent way to provide for a college education, and in many cases, the interest on bonds is tax free if used for tuition. Consider asking relatives to deemphasize other presents and give savings bonds as gifts at graduations and other special occasions. Talk to your children regularly about the benefits of savings and investments. Discuss the concept of interest income, and even think about paying them interest on money they earn themselves. Start a savings account for your child in his or her own name, and encourage pride in adding to it on a frequent basis. Take your child with you to the bank and allow him or her to see the process of saving and spending from beginning to end. If your child has a special purchase in mind, don’t dampen the enthusiasm by discouraging withdrawing money to buy it. Simply help your child keep everything in perspective by showing how funds used for one purpose will no longer earn interest and cannot be used again. Encourage your child’s understanding of record-keeping by going over online accounts together and holding on to receipts for a time in order to verify purchases. Allow your child to help you set up a record-keeping system and to take notes on future planned purchases. Especially as your child grows older, allow him or her to make some financial decisions independently, even if they turn out to be poor ones. Learning from mistakes can be a strong motivator for later carefulness and planning. Do your own online research together to compare potential purchases and discuss the trade-offs that your child will make by opting to buy one item over another. Help your child evaluate the truthfulness and usefulness of media advertising. Teaching your child to become a skeptical consumer of advertising will provide him or her with a valuable perspective, particularly during the traditionally high-consumption teen years, when peer pressure to buy popular branded items reaches a peak. Discuss the difference between media hype and the true value of a consumer item with your child, as well as the techniques advertisers use to encourage spending. As your child approaches college, you may be considering offering him or her a credit card. Just be aware that many students use credit cards to obtain cash advances rather than solely for emergencies. Talk with your child about credit card interest rates on discretionary purchases and about the possibility of taking on a part-time job if necessary or desirable. And remember that if you have already shown your child examples of responsible credit card usage on your part, he or she will be more ready to demonstrate responsibility as a young adult. A five-year-old’s trip to a family restaurant can spark a meaningful discussion about credit, spending, and interest that an 18-year-old may remember. A principal with the firm of Fortress Investment Group, LLC, Peter Briger holds a master of business administration from the Wharton School of the University of Pennsylvania. A previous partner with Goldman, Sachs & Co., he co-directed that firm’s Fixed Income Principal Investments Group. Pete Briger accepted the position of co-chairman at Fortress in 2009. Great article. It is really important to start teaching your kids about money from an early age. Kids tend to be sponges to the things we do as parents. You had a great idea about using stories because I think that is the kind of stuff that will sink in the most. Exactly! No kid wants to hear their parents give some incredibly long and boring lecture about the importance and value of money. Try and make it fun–for both of you! “It is a trite but true Observation, that Examples work more forcibly on the Mind than Precepts.” So Said Henry Fielding and I believe setting a shining example on the kids is something that they will try to emulate and live upto for many years of their lives. Wonderful and eye-opening post! Mr.Fielding is one smart cookie. Thanks for reading! Absolutely wonderful points! I must say a great article to tell how to be a good parent while making your child aware about money’s worth. Did you forget to mention piggy bank? Not just filling it up, but also spending the money in it for buying something that your child wants, or needs to buy like gifts for friends, story books, etc.